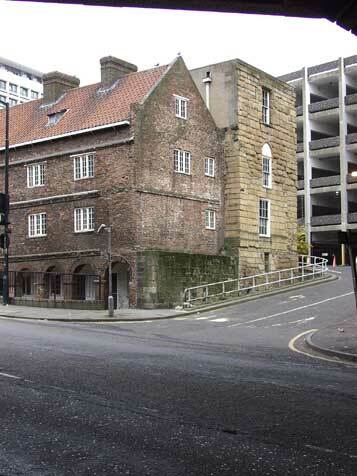 In 1681 the Corporation of Newcastle built the Holy Jesus Hospital adjacent to Pilgrim Street near the river. This was not a place for sick people, but a house for the reception and entertainment of pilgrims, travellers, or strangers. It was set up to house a master and 39 poor freemen or their widows. It was built in the then new style of brick structure, and occupied the site of an earlier Austin friary. It is now dwarfed by Swan House roundabout, and the photo below, taken by famous Tyneside amateur photographer Jimmy Forsyth in 1962, shows the preparation for the new roads. Part of the building was used by Urwin and Co, manufacturers of chemicals and similar products. The acids and other dangerous agents were made, stored and despatched here in the heart of the city, in an area where the fashionable shoppers and the smelly industry met. During the late 1960s a major intersection and motorway underpass was constructed with Swan House, a telecoms centre built on top in a daring 60s style. The old Holy Jesus Hospital was, of course, protected by its historical importance, but the same grace was not extended to Grainger's Central Arcade, slap dab in the middle of the new development. 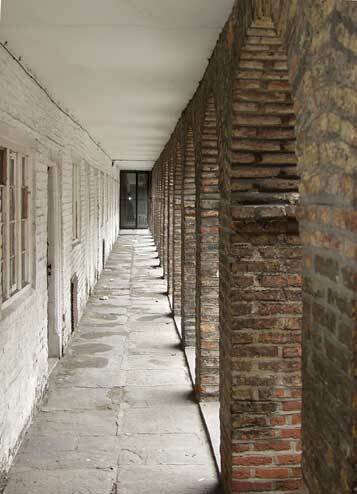 The Hospital was built using the relatively modern method of brick construction. 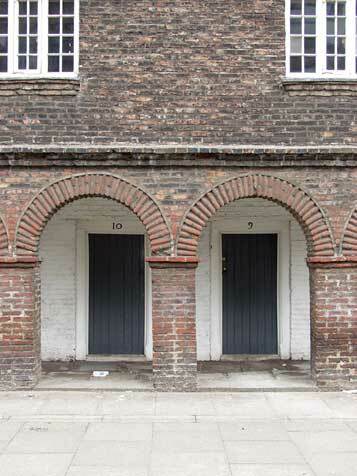 At the close of the 17th century brick was used mostly as an infill in timber framed buildings. This use of bricks was novel at the time and was also employed in the construction of Alderman Fenwick's house, that still stands on the opposite side of Swan House. The Holy Jesus was a collection of individual dwellings with some communal areas on upper storeys. The front doors lead onto an arcade and face south. This would have been a sunny aspect with beautiful river views when it was built. Today it is impossibly hemmed in by the modern constructions around it. 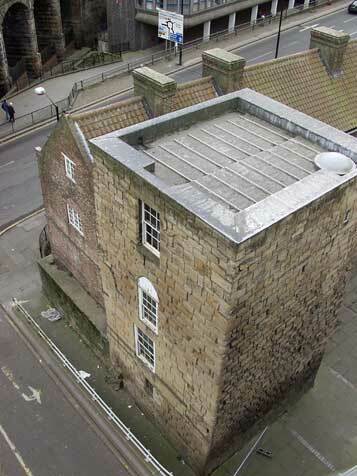 The building was put to use as the Joicey Museum from 1971 until 1994, since when it has lain empty. The National Trust is currently overseeing some remedial work to the fabric and a new and faintly commercial use is planned for this gentle place. "Hospital for poor people by the expense of the citizens and leaders of Newcastle upon Tyne in the year of salvation 1683. 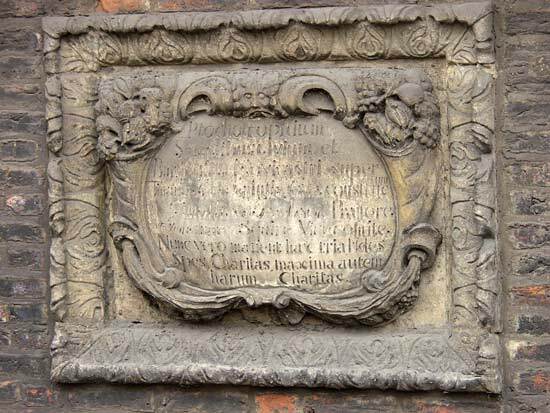 Built by Timothy Robson, Mayor, John Squire Sheriff, but now only remains the three of Faith Hope and Charity, and the greatest of these is Charity." 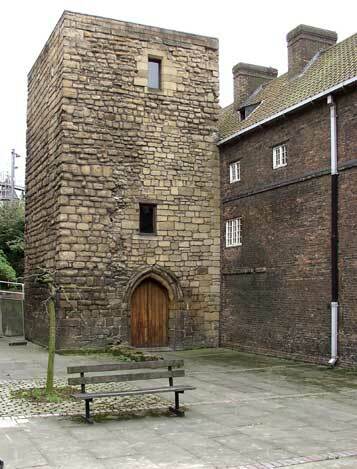 The rear north-eastern corner is attached to a 13th century tower that remains from the Austin friary. 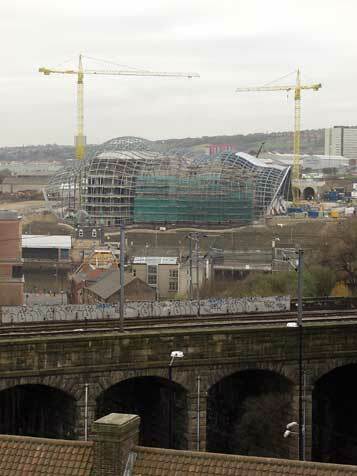 In the picture here it is seen backing onto Manors Car Park. 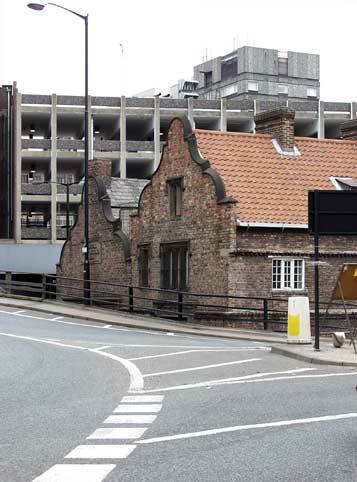 The car park plot was previously occupied by a poor house, the Bridewell house of correction and a charity school. In 1880 the police station that was situated next to the Holy Jesus was demolished and replaced by a Steam Soup Factory, and its style was harmonised with the hospital. 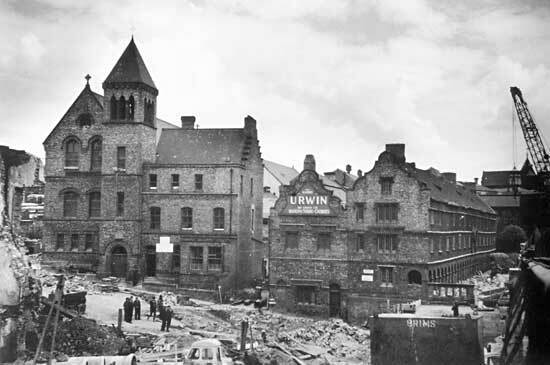 It is this building that later became Urwin's chemical works. It still stands, although the elevated roundabout road skirts past its upper storey. The picture below shows this clearly, with the 1960s Cuthbert House, home of the sadly disbanded Tyne & Wear Council as backdrop. Those cars whizzing round the roundabout are heading for the 1928 Tyne Bridge. 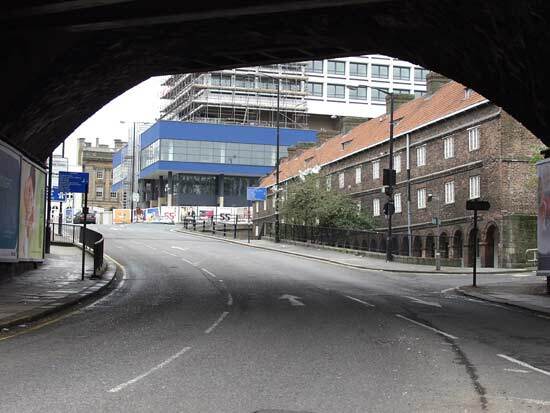 The left spur is City Road leading to Melbourne Street, named after the 1835-41 Whig Prime Minister. Extended to here in 1882, City Road was the main easterly route to Walker and Wallsend. Below this deck runs the Central Motorway. "Today this area is called Manors after the Manor of Walker that the Corporation purchased in 1715. It had petitioned Parliament for the means to afford the purchase but it was rejected due to the lack of a King's licence, and the land reverted to the Crown. Shortly before the outbreak of the Second World War, the Hospital was considered unfit for further habitation, and a new Holy Jesus Hospital was built at Spital Tongues, in the fresh air rather than here, a place that had become foul with the stench of acid manufacture. Some internal fixtures were moved to the new building and this old building lay unused for a number of years until the later redevelopment of this area during the 1960s. The dark oak staircase in the centre of the building remains, but the internal partition walls have been altered and renewed over the years. 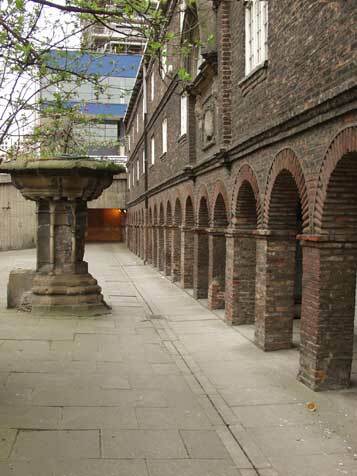 A small fountain stands at the front of the building and this area was once a green lawn but this was truncated by the building of City Road in 1882. Seen here, beyond the old building and the road, is Swan House, currently being extensively redeveloped from an telecoms office complex to city centre dwellings. This will be called 55 degrees North, from the approximate latitude of this place. A similar development was named from its latitude in Bristol city centre. 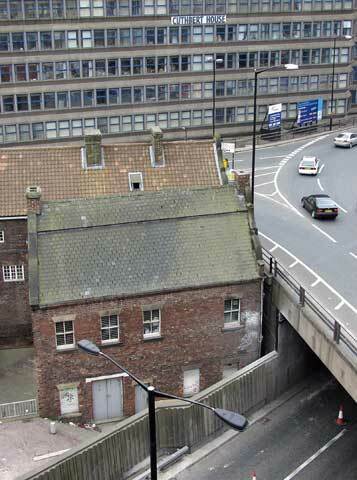 Below is the nearby Manors Tram headquarters. This housed the Tramway offices, a small engineering works and tram shed, as well as an electricity generator for the system. 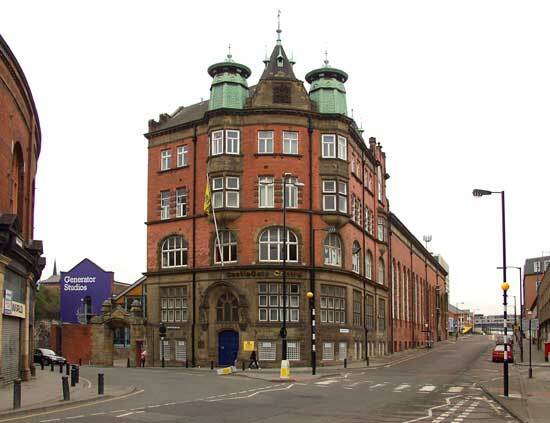 It became the central offices for the Corporation Transport and later the PTE and Tyne & Wear Transport. This building is now a church owned concern and the revamped electricity station with its planar glass windows has been christened "Generator Studios". Across the river from this point Richard Rogers' new music centre is taking shape. This will house a concert hall and practice area and will link to the Baltic Contemporary Art Centre. Evidence of an earlier building frenzy, this time driven by the railways is evident here. That line is the east coast main line to Scotland, joining the High Level Bridge line from the south, and cutting the Castle in half before entering the Central Station.